The release notes state that AMD/ATI still recommend that 8.40.4 remain the version provided by distros - I'd believe it. I've had graphical corruption, non-working compiz, glibc double-free errors, and general unhappiness with this version of the driver on my dual-head setup with a 9600XT. However, since it is the first version to support Xorg 7.3 (xorg-server 1.4) it will remain in [testing] with xorg-server. If Xorg 7.3 moves out of testing, fglrx 8.42 will follow it. -Video playback under compiz fusion doesn't work well. Does problems aside, I am really pleased with this release! My desktop cubes rotates smoothly and all the fusion effects work. I have installed this version from testing. I have a P4/HT notebook with a dedicated Radeon Mobile 9600 (M10). While I had some issues with the 8.41 version regarding corruption in the lower right corner (and under the mouse), but infrequent and not easily reproducible, I have not experienced this with the 8.42 yet. It seems to work ok so far. I havent tried compiz due to lack of time. While I was downloading the package I also installed xorg-server 1.4 and all that stuff. So all this is running well so far. The Control Center is not working at the moment, can you confirm that? Many people are having issues with amdcccle not displaying any window, although the process starts and runs. - Playback of video files (*.flv, *.wmv, *.mpg, etc) in various players (xine, mplayer. vlc) improved. With the Radeon driver, video will sometimes go black when moving (or re-sizing) the playback window. Video can always be recovered by slightly moving the window, and once the window is left undisturbed, no issues occur. However, with the fglrx 8.42.3 driver, the playback windows can be moved or resized without ever experiencing the temporary black-outs ... even with Compiz-Fusion running. Anyway, the trade-offs were too great with fglrx 8.42.3 versus the Radeon open-source driver, so I'll be waiting for the next release from ATI. Thanks for all your efforts, Cerebral. How about 64bit? It seems that 32bit gets all the attention. If you could point me to the pkgbuild that would be great. I'd love to hear some 64-bit reports. One of the reasons AMD/ATI didn't include kernel 2.6.23 support in this release was supposedly problems with 64-bit, so anyone willing to report on this would be awesome. Thanks. I'm not currently on my 64bit computer, but I'll get to it when it's available. I'm running a 2.6.23-kamikaze kernel with 8.42.3 running a Mobility X1400. I can confirm that the amdcccle does not open a window although the process does execute. AIGLX and video playback work fine as far as I can tell, and I'm not having any problems with slow scrolling. However, at least in Firefox, middle-clicking to autoscroll glitches the cursor across the screen as it moves down. 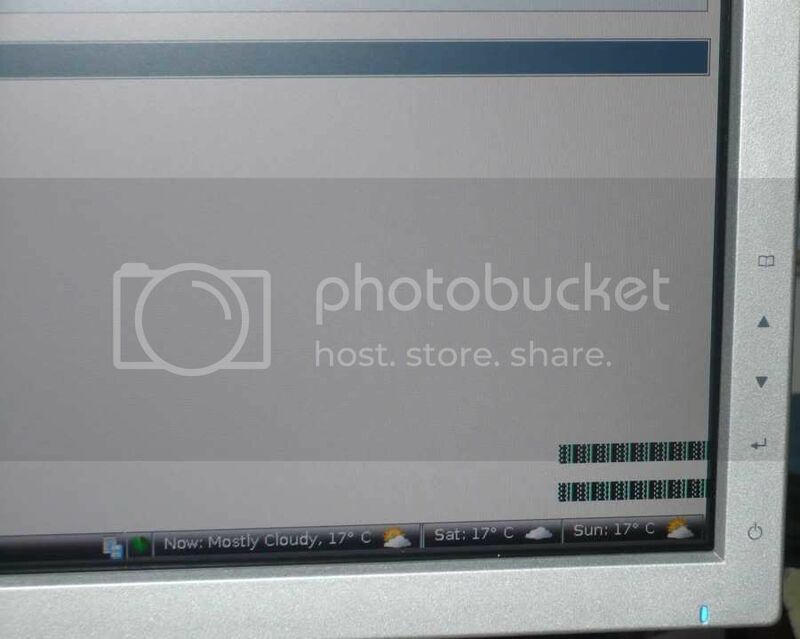 Also, when I log out from XFCE4, I see a brief flash of screen corruption. 3d performance is much improved from 8.40.7. Overall, I'm happy with this driver even if it does still feel a bit "experimental". Many people, myself included, are getting corruption in the bottom-right corners of their screen, as well as directly beneath the mouse. Will try the new driver only now but I can say that I get the screen corruption from time to time with different recent versions of fglrx in arch, kubuntu and suse. P.S. Havn't looked at AIGLx for a while, what benefits can I get from it (after enaling Composite in xorg.conf of course) in KDE now? And most of all are there other things to do? I never tried with 1.4 (1.2 only) and I still had the issues. I have installed it onto 64bit. I get the problem with the corner. My FPS has multiplied at least by 2 (maybe 3!) on glxgears, but KSplash doesn't work. Next I will try out compiz fusion. EDIT: I enabled AIGLX and the corner problem has disappeared. EDIT3: Compiz Fusion doesn't work on KDE very well I can see (didn't work too well before with the open source drivers) The built in compositor for KDE3 works, but not too well. you mean by adding Compisite "Enabled" in extensions and AIGLX "True" in ServerFlags? I've got these both set and still experience corruption. What's more interesting that after the corruption appears Xv output does not work properly anymore, it seems like the lower diagonal displays undefined blurred thing, whereas the upper diagonal has the data that should normaly be in the lower part. EDIT: Tried Compiz Fusion again and it worked (almost) ! I got a white screen...and I had to restart X. Maybe upgrading to Xorg 1.4 would help? 8.42 manages to suspend on my laptop, but it doesn't resume. I have a FireGL V5200 and I hacked the PCI ID to a X1600 for 8.42 to work so its not surprising. Im having a watermarkk issue with both 8.4 and 8.42 from testing. I made a bugreport. I hope it really does fix it permanently for you - there've been a lot of "red herring" Xorg.conf fixes for the corruption, but it's always seemed to come back. For me not using Xv output seems to solve the problem, switching all players to opengl helps. BTW. does anyone know why there is no gstreamer OpenGL output package in repositories? Anyone know why it's not working? I actually tried a Ubuntu livecd to see if it would work. But I got the same problem. And it was 32bit. Does anyone else get this white screen when running "fusion-icon"? I just switched to the new open source drivers which I wanted to check out anyways (6.7.195).